It's fun and easy and everyone wins. - 1 x 20 4 Pin. - 1 x 4 4 Pin. - 2 x 6 2 Pin. Otherwise, the order is already on its way. Our approach to tech recycling allows us to utilize perfectly good products that would otherwise head to the landfill. Great working condition. No power cord. Removed from my home theater PC, ran great. Will ship promptly to the winning buyer via USPS Priority Mail. Active Power Factor Correction [99% PF Typical]. Ultra Ventilation (Honeycomb Structure). Mfr Part Number: S12II 620 BRONZE. 80 PLUS Bronze Certified. Output: 3.3V @ 24A; 5V @ 24A; 12V1 @ 24A; 12V2 @ 24A; -12V @ 0.8A; 5VSB @ 2.5A. 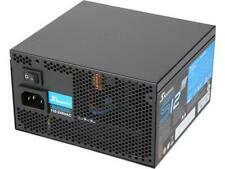 1 x ATX12V. This¸ combined with Active Power Factor Correction¸ enables the S12II Bronze to reduce energy waste¸ boost power efficiency and more importantly¸ reduce the energy costs for the users. Power Factor Correction (PFC) Active. 80PLUS Bronze Certified High Efficiency. Active Power Factor Correction [99% PF Typical]. Ultra Ventilation [Honeycomb Structure]. Mfr Part Number: S12II 520 BRONZE. 80 PLUS Bronze Certified. Output: 3.3V @ 24A; 5V @ 24A; 12V1 @ 20A; 12V2 @ 20A; -12V @ 0.8A; 5VSB @ 2.5A. 100% burn in, high temperature cycled on/off. Over power protection. Total Power: 650 W. 100% hi-pot test. Efficiency: > 82%. Frequency: 47 - 63 Hz. Current: 100A max. Short circuit protection on all outputs. Total Power: 450W. MTBF: 100000 hours (@ 25 °C excl. 80 PLUS Bronze certified. Output: 3.3V @ 18A 5V @ 18A 12V @ 35A -12V @ 0.3A 5Vsb @ 2.5A. Protection: OPP OVP UVP SCP. Frequency: 50 - 60Hz. Mfr Part Number: SSR-450GB3. ). (S12II 520 BRONZE). DC Output Rail 3.3 V 5 V 12 V1 12 V2 -12 V 5 VSB. Total continuous power 520 W. When the fan shaft rotates, high pressure oil drifts along the grooves of the bearing sleeve to generate a thin layer of lubrication between the bearing faces. Total Power: 550W. MTBF: 100000 hours (@ 25 °C excl. 80 PLUS Bronze certified. Output: 3.3V @ 20A 5V @ 20A 12V @ 45.5A -12V @ 0.3A 5Vsb @ 2.5A. Protection: OPP OVP UVP SCP. Frequency: 50 - 60Hz. Mfr Part Number: SSR-550GB3. ). S12 Energy Plus. SLI Certified. 80 PLUS Certified. Maximum Power. SATA Power Connector. Input Current. Input Frequency Range. 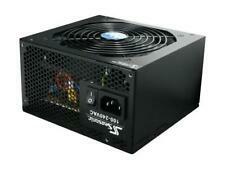 100 - 240 V.
Total Power: 500W. 80 PLUS Bronze certified. Output: 3.3V @ 20A, 5V @ 20A, 12V @ 40A, -12V @ 0.3A, 5Vsb @ 2.5A. Protection: OPP, OVP, UVP, SCP. Frequency: 50 - 60Hz. MTBF: 100,000 hours (@ 25 Â°C, excl. ). Testing Procedure. Connector(s) 20 4 Pin. If possible, include photos or video to assist in understanding the problem. Key Functions Test Expected Result Result. Tested for key functions, R2/Ready for Resale. 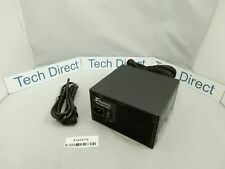 Seasonic S12 II Series 620 Bronze - 620W ATX 12V 80 PLUS Bronze - USED and Good! 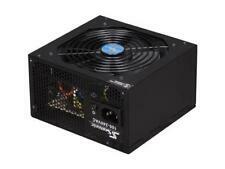 Seasonic S12 II Series 620 Bronze - 620W ATX 12V 80 PLUS Bronze. Condition is Used. Shipped with USPS Priority Mail. Total Power: 650W. 80 PLUS Bronze certified. Output: 3.3V @ 20A, 5V @ 20A, 12V @ 54A, -12V @ 0.3A, 5Vsb @ 2.5A. Protection: OPP, OVP, UVP, SCP. Frequency: 50 - 60Hz. MTBF: 100,000 hours (@ 25 Â°C, excl. ). Founded in 2008 and located in Norfolk, Massachusetts, Electronix RèDux Corp. remains family, as well as Veteran, owned and operated. RMA numbers will not be extended or re-issued. Condition : Used, Cleaned, Tested & Inspected, Fully Functional & Performs as intended, Pulled from working unit. Die S12II Bronze Serie bietet neben seiner umweltfreundliche Effizienz wichtige Features, wie das beständige und seit Jahren bewährte Schaltungsdesign, die eine zuverlässige Energieumwandlung gewährleistet. Model: S12II 620 Bronze. MPN: S12II 620 Bronze. Manufacturer: SeaSonic USA. Die S12II Bronze Netzteile verfügen über das 80 PLUS Bronze-Zertifikat, das der kompletten Produktserie einen guten Wirkungsgrad bescheinigt. Diese Effizienz, kombiniert mit einer hohen aktiven Leistungsfaktorkorrektur ermöglicht diesem Netzteil die Energieverschwendung zu minimieren. 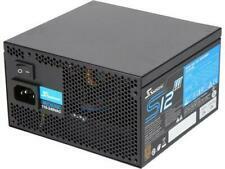 SEASONIC S12II-620 BRONZE SS-620GB ACTIVE-PFC F3, 620WATTS. 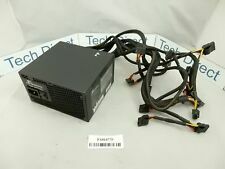 For ATX Power 80 Plus Bronze Series C8 Used Condition 100% Working Perfect! C8 USED CONDITION (100% WORKING)! This efficiency, combined with Active Power Factor Correction, enables the S12II Bronze series power supplies to lessen energy waste, which translates into savings on the costs of energy costs for its users. Seasonic S12II 430 BRONZE. There is no doubt that the S12II-430 is all you need for a peace of mind. Model:S12II 430 BRONZE ; SS-430GB. This efficiency, combined with Active Power Factor Correction, enables the S12III Bronze series power supplies to lessen energy waste, which translates into savings on the costs of energy costs for its users.